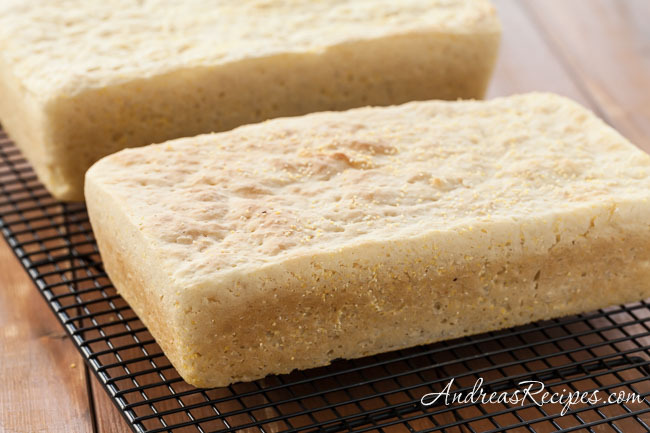 This English muffin bread is an old Meyers family favorite. Also known as English Toasting Bread, it’s a good bread for slicing and toasting for breakfast or brunch. It’s a yeast bread that doesn’t require kneading, and you spoon the sticky dough into the pans. 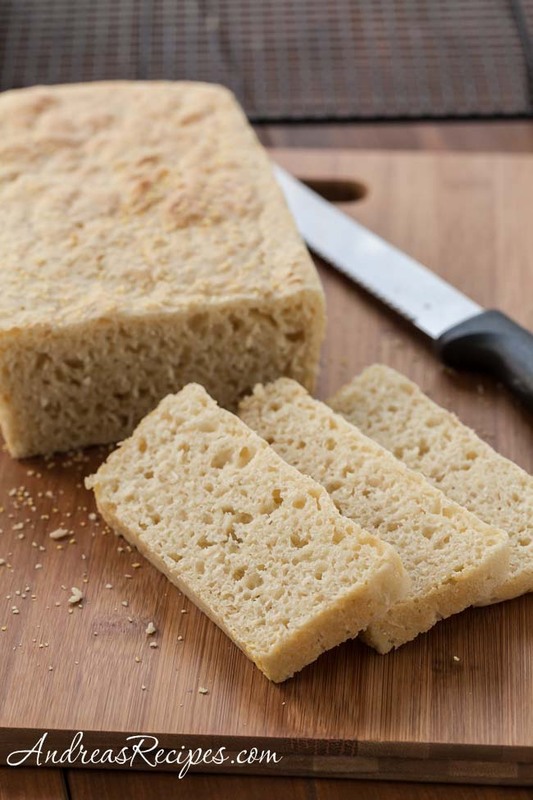 For its sheer simplicity, it’s a great recipe to try for a first yeast bread. The bread works equally well with active dry yeast or instant yeast. We love this toasted with butter, cinnamon, and sugar, and my boys ask for it as a snack with just a little butter or jam smeared on top. It’s a good thing the recipe makes two loaves, because it never lasts long around our house! In the bowl of the stand mixer, stir 3 cups of flour with the yeast, sugar, salt, and baking soda. Combine milk and water and heat until very warm (105-115° F/41-46° C). Add to the dry ingredients and mix well. Continue stirring and adding flour until the dough is very stiff. Spoon the batter into the prepared loaf pans. The dough will be sticky and won’t necessarily look pretty in the pans, but that’s ok. Sprinkle more cornmeal on top of each loaf. Lightly spray some plastic wrap with cooking spray and lay over the loaf pans. Cover with a towel and let rise in a warm draft-free location for 60 minutes. During the last 15 minutes of rising, preheat oven to 375° F/190° C.
Bake for 25 minutes. Remove from pans immediately and let cool on a wire rack. Serve warm or toast the slices. You can also hand mix the batter if you have a strong arm and a strong silicone spatula. Prep Time includes rising time.